Strong leadership pays dividends in the digital economy, where continuous innovation, rapid decision making, and a global mindset are essential to success. Oxford Economics surveyed more than 4,100 executives and employees, around the world and from diverse industries, during the second quarter of 2016. We found that companies that get digital leadership right perform better in the marketplace and have happier, more engaged employees. 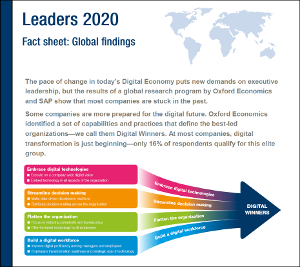 The pace of change in today’s digital economy puts new demands on executive leadership, but the results of a global research program by Oxford Economics and SAP show that most companies are stuck in the past. Some companies are more prepared for the digital future. Oxford Economics identified a set of capabilities and practices that define the best-led organizations—we call them Digital Winners. At most companies, digital transformation is just beginning. Compare progress on a country-by-country basis in the fact sheets below. Click here to read the think piece. This vision of a digital company looks a lot like that of a well-run small-to-midsize business. Yet reality is more complicated. Most small-to-midsize businesses face the same digital-transformation hurdles and growing pains as their bigger rivals—issues that start with a lack of appropriate executive leadership. Oxford Economics recently surveyed 2,050 senior executives and 2,050 employees from around the world and across industries about the ways leadership and organizational strategies are changing for the digital era; these surveys included a meaningful sample of SMBs. Our analysis of survey data revealed several critical imperatives for SMB leaders.